It's springtime in Humboldt and everything's coming up rhodies. This year, there's a big hoopla happening in the world of the brightly colored flora as Eureka hosts the International Convention of the American Rhododendron Society, "Rhododendrons in the Redwoods," April 27-30 with activities centered at The Red Lion Hotel and the Sequoia Conference Center (prices vary for events, see www.eurekarhody.org for details/registration). The conference features local speakers and those from as far away as France — presentations, tours, a photography show and plant sale, as well as a free presentation on soils on Sunday, April 30 at 11 a.m. in the plant sale tent in the hotel parking lot. 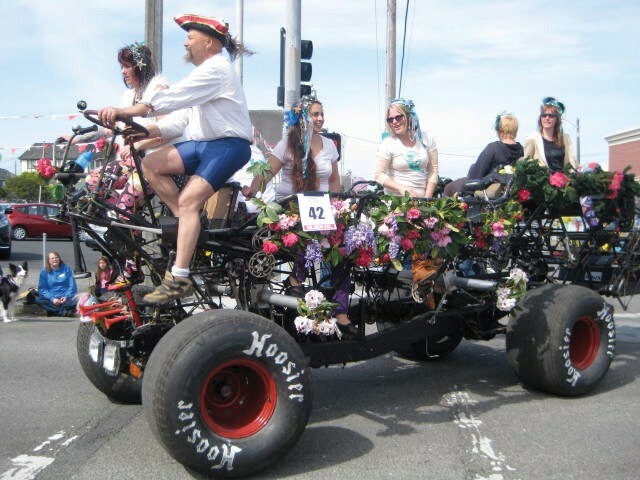 The convention coincides with another annual rhododendron event, the Rhododendron Festival and Parade, a Humboldt county tradition that sees flowered floats, horses, kids on bikes, vintage cars, school bands and local dignitaries waving to the crowds as the procession winds its way through Eureka. The parade is on Saturday, April 29 starting at 10 a.m. in Henderson Center, traveling east on Seventh Street, south on H Street, west on Henderson and concluding near the Eureka Mall (free). After the parade, step back in time at Fort Humboldt during the annual Dolbeer Steam Donkey Days, when the Timber Heritage Association cranks up the historic Falk shay locomotive, offers speeder train rides and gives logging and equipment demos until 4:30 p.m. (free).